President Muhammadu Buhari yesterday assured that all ongoing Federal projects in the Southeast will be funded, saying that the seven-month delay in passing this year’s budget will not serve as an excuse. 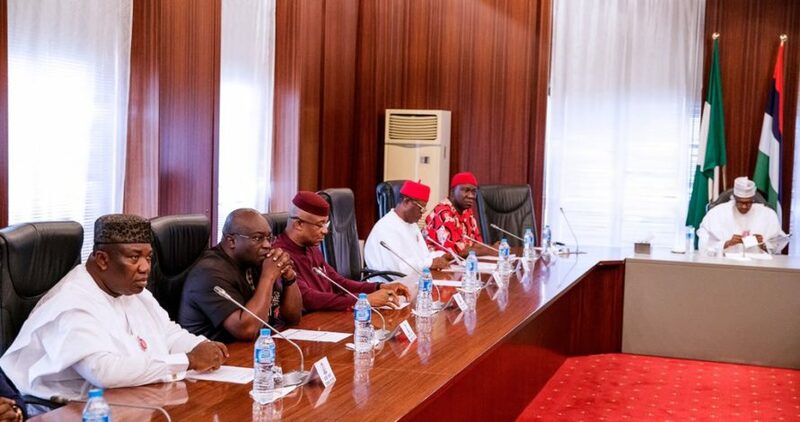 He gave the assurance at a meeting with Southeast political leaders, including governors and Deputy Senate President Ike Ekweremadu at the State House in Abuja. The President pledged that the Federal Government will sustain the support to the zone in terms of infrastructure. He explained that part of the noticeable problem in the delay in the execution of the capital projects was caused by the budget delay. The statement reads: “When you sign and you don’t pay, they (contractors) can legally jack up their costs. This is part of the problem. President Buhari hosted the Southeast leaders in the company of the meeting by Secretary to the Government of the Federation (SGF) Boss Mustapha; ministers Ogbonnaya Onu (Science & Technology); Okechukwu Enelemah (Industry, Trade & Investment); Chris Ngige (Labour & Employment); Rotimi Amaechi (Transportation) and Babatunde Fashola (Power, Works & Housing). He responded from point to point on all the issues raised by the Governors, to their satisfaction. On the undulating surface of the Akanu Ibiam International Airport, Enugu, the President assured that it will be addressed in the new budget. He also spoke of government’s interest in the new Port-Harcourt-Maiduguri standard gauge railway which transverses several states including those in the Southeast. Amaechi gave assurance that the project, the single most costly rail project at $12 billion, will soon be tabled before the Federal Executive Council (FEC). The ministers were directed to follow up with the private sector on key projects in the region, including the South East Dry Port and the Geometric Power Plant in Aba, with a view to untangling the problems causing their delayed take-off. Speaking on behalf of the governors, Dave Umahi (Ebonyi State) said they had come specifically to thank the President for the award of the contract for the major component of the second Niger Bridge at the cost of N206 billion. ‘‘The project is the dream of our people and it has become a dream come true. Our people said we must come and thank you. Your Excellency, Mr. President, we are grateful Sir," he said. Other governors on the delegation were Okezie Ikpeazu (Abia), Ifeanyi Ugwuanyi (Enugu) Anambra State Deputy Governor Nkem Okeke.